I drafted my previous post about support for meditation while in Hong Kong en route to Italy. Now that we are in Lake Como in northern Italy, I have been able to reflect on my experiences in Hong Kong. This post is a result of those reflections. During our Hong Kong stay we visited Chi Lin Nunnery which is a functioning monastery for Buddhist nuns. 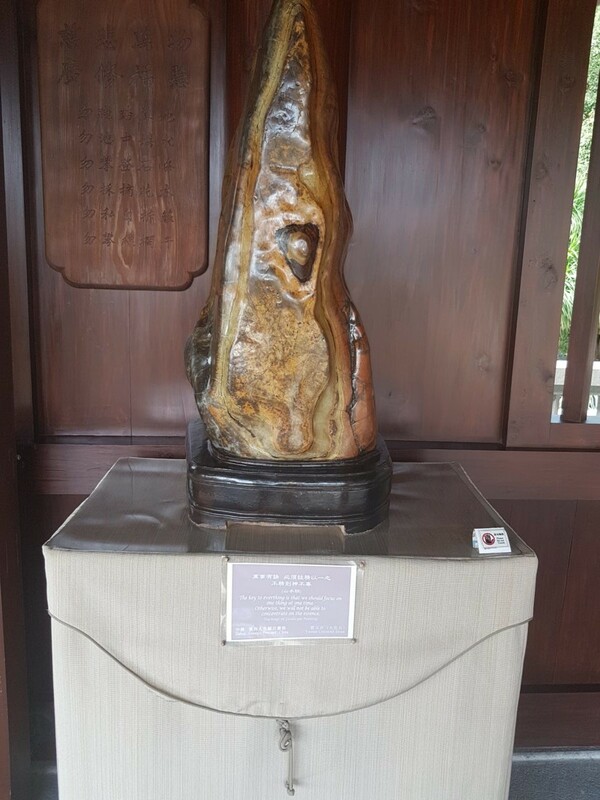 The Nunnery is an exquisite structure and in the cloisters surrounding the central gardens are sculptures made from Yantan Stone, each with an inspirational subscription. 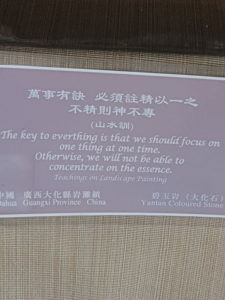 The key to everything is that we should focus on one thing at one time. Otherwise, we will not be able to concentrate on the essence. It is interesting that the Chinese knew about the deficiencies of multitasking long before neuroscientists demonstrated through research that multitasking is inefficient, consumes vital energy and is counter-productive. Dr. Daniel J. Levitin, neuroscientist and author, addresses the negative impact of multitasking in his book, The Organised Mind: Thinking Straight in the Age of Information Overload. He maintains that constantly changing our focus through multitasking drains our neural resources. In the process, we are consuming our vital glucose reserves which is why multitasking makes us tired. It also increases our stress levels. According to Dr. Levitin, multitasking also negatively impacts our capacity to discriminate, e.g. discern the difference between fact and fiction. He also argues that when we are multitasking we are storing information in a part of the brain that is difficult to access – so information is incorrectly categorised in the brain. Other neuroscientists have also demonstrated that multitasking is inefficient and impacts negatively on our productivity and creativity. in contrast, a single focus is an essential element in building creativity. Dr. Levitin, being a musician himself, studied the behaviour of great songwriters and musicians, like Eric Clapton and Sting, and found that their capacity for a single focus and ability to be-in-the-moment were key factors contributing to their creative success. As we grow in mindfulness, we increase our capacity to maintain a single focus during our daily endeavours thus increasing our productivity and creativity and avoiding the downfalls of multitasking.